Gene Coleman presents the New York premiere of Spiral Network and Sendai Transmissions, a world premiere of a new commissioned work by Chamber Music America. Both works will be performed by Ensemble N_JP, an ongoing cross-cultural project with Japanese and Western instruments, and with special guest vocalist, baritone Thomas Buckner. Momenta Quartet will perform string quartets composed by improvisional artists, including Yusef Lateef, Arthur Kampela, Gordon Beeferman, and a world premiere from Adam Rudolph. Gene Coleman is a composer, musician and director. Winner of the 2013 Berlin Prize for Music, he has created over 70 works for various instrumentation and media. Innovative use of sound, image, space and time allows Coleman to create work that expands our understanding of the world. Since 2001 his work has focused on the global transformation of culture and music’s relationship with other media, such as architecture, video and dance. In 1987 Coleman founded Ensemble Noamnesia and in 2001, he created Ensemble N_JP. Coleman has performed with the likes of Evan Parker, Derek Bailey, Roscoe Mitchell, William Parker, Taku Sugimoto, Kevin Drumm, Yuji Takahashi, Theo Bleckmann, the group Ossatura and many others. Coleman has also recorded and performed with the experimental rock group Gastr del Sol, as well as several projects with Jim O’Rourke and the minimalist composer Tony Conrad. Since 2000 he has been the artistic director of Soundfield, a producing and presenting organization with operations in Philadelphia, Chicago, New York and internationally. The Momenta Quartet’s mission is to bring the best of contemporary music to audiences in New York City and around the world with a vision of new music that embraces composers from all cultures and from diverse musical backgrounds, including jazz and avant-garde improvisation. Praised by The New York Times for its “focused, fluid performance” and by Sequenza 21 for its “fire, fantasy and absolute musical commitment,” the Momenta Quartet has premiered over 50 works in the past eight years and has collaborated with over 80 living composers. 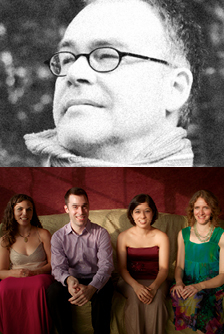 Now in its ninth year in residence at Temple University, the quartet has performed in England, Singapore and Indonesia, and has received grants from the Koussevitzky Music Foundation, Meet the Composer, the Aaron Copland Fund, the Brooklyn Arts Council and the New York State Council on the Arts.